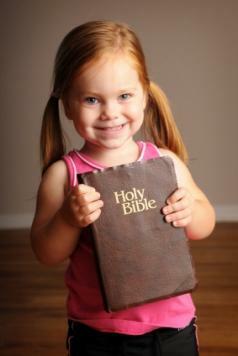 Even very young children will enjoy memorizing Bible verses for children. Sunday school classes and vacation Bible school sessions often focus on teaching Bible verses. Not only is this a wonderful way to introduce the Bible to kids, but it also encourages them to practice memorization. Obviously, some verses are too long and confusing for children to memorize, especially preschoolers. However, there are several favorite Bible verses for children that are easy to remember, and many of these may stick in your child's memory even into his adult years! Whether you are a Sunday school or church daycare teacher or a parent wanting to instill the love of the Bible in your children, you may find that teaching your child Bible verses will enhance his reading comprehension and memorization skills, as well as encourage him to understand various sections of the Bible. Incorporate Bible verses for children into everyday lessons by making it fun! One of the easiest ways to memorize a passage is to turn it into a song. Pick a simple tune, like "Row, Row, Row Your Boat", and adapt the passage to that melody. Focus on one Bible verse each week, and reward kids with a treat or small toy once they can recite it. Play a game that has kids fill in the missing words as you recite portions of the scripture. Divide the class up into teams, and let teams compete as they try to recite as many Bible verses as possible. This is a great game for older kids! The following verses are often used in Sunday school classes and vacation Bible school lessons. I Corinthians 15:13- Do not be misled. Bad company corrupts good character. Psalm 100:2-Worship the LORD with gladness; come before him with joyful songs. II Peter 3:18- But grow in the grace and knowledge of our Lord and Savior Jesus Christ. To him be glory both now and forever! Amen. II Corinthians 9:8-And God is able to make all grace abound to you, so that in all things at all times, having all that you need, you will abound in every good work. Hebrews 5:8-Although he was a son, he learned obedience from what he suffered. John 3:16-For God so loved the world that he gave his one and only Son, that whoever believes in him shall not perish but have eternal life." Jeremiah 31:3-The Lord appeared to us in the past, saying: I have loved you with an everlasting love; I have drawn you with loving kindness. Psalm 107:9-For he satisfies the thirsty and fills the hungry with good things. Psalm 62:11-One thing God has spoken, two things have I heard: that you, O God, are strong. Isaiah 26:3-You will keep in perfect peace him whose mind is steadfast, because he trusts in you. John 14:2-"In my Father's house are many rooms; if it were not so, I would have told you. I am going there to prepare a place for you. Hebrews 13:5-Keep your lives free from the love of money and be content with what you have, because God has said, Never will I leave you; never will I forsake you. Romans 8:37-No, in all these things we are more than conquerors through him who loved us. John 3:30-He must become greater; I must become less. I John 5:13-I write these things to you who believe in the name of the Son of God so that you may know that you have eternal life.